Twitter personality Umm UbaydullahSomali is an alleged Islamic extremist and proponent of violent ideology.Umm UbaydullahSomali, Twitter, accessed July 2, 2015, https://twitter.com/ummubaydullah11. CEP believes she is female, as “Umm” in Arabic means “mother of” and “Abu” means “father of.” She is possibly of Somali descent, given the modifier used in all iteration of her Twitter name, i.e. “Somali” or “Somaliyah.”Umm ZubayrSomaliyah, Twitter, accessed August 19, 2015, https://twitter.com/Ummu_Zubayr. After each suspension, UbaydullahSomali references her previous suspension in a tweet and attaches a screen shot of the suspension notice from Twitter. According to the screenshots, her Twitter settings are in Dutch, and she uses the mobile provider BASE which is used in Belgium and Germany. CEP believes she operates out of Belgium. Like other Twitter propagandists who are suspended from Twitter, this user continues to slightly modify their handle with numbers. However, Umm UbaydullahSomali often has not changed her handles in numerical order, going from @ummubaydullah1 to @ummubaydullah13 then @ummubaydullah12. Her tweets suggest her support for strict Islamic law. In one tweet, she supports stoning and derides those who do not:Umm UbaydullahSomali, Twitter Post, June 23, 2015, 4:52 a.m., https://twitter.com/ummubaydullah11/status/613283587920687104. After several days of seemingly being off Twitter at the end of September 2015, Umm Ubaydullah activity surges under the user handle @IiiiiTaken. Despite the account showing it was created in June 2012, the first tweet shown on the account is as of September 22, 2015. It appears that she has gone back to referring to herself as Umm Ubaydullah, as opposed to Umm Zubayr.Umm Ubaydullah S, Twitter, accessed December 18, 2015, https://twitter.com/IiiiiTaken. Without being suspended or deleting her previous account, Umm Ubaydullah activity continues under a different handle, @ummubaydullah15. The user reverts back to her system of using her name and a number as a differentiator. Umm Ubaydullah appears to again be using more extremist rhetoric:Umm Ubaydullah, Twitter, accessed December 18, 2014, https://twitter.com/ummubaydullah15. @IiiiiTakenUmm Ubaydullah S, Twitter, accessed October 12, 2015, https://twitter.com/IiiiiTaken. @Ummubaydullah15Umm Ubaydullah, Twitter, accessed December 18, 2015, https://twitter.com/ummubaydullah15. 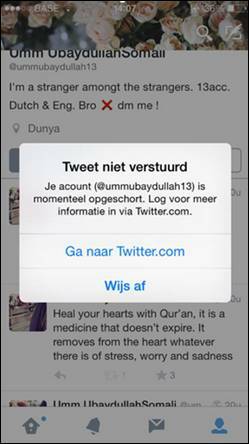 @ummu_zubayrUmm ZubayrSomaliyah, Twitter, accessed August 19, 2015, https://twitter.com/Ummu_Zubayr. @ummubaydullah1Umm UbaydullahSomali, Twitter, accessed July 21, 2015, https://twitter.com/ummubaydullah1. @ummubaydullah10Umm UbaydullahSomali, Twitter post, June 23, 2015. @ummubaydullah11Umm UbaydullahSomali, Twitter, accessed July 16, 2015, https://twitter.com/ummubaydullah11. @ummubaydullah12Umm UbaydullahSomali, Twitter, accessed August 3, 2015, https://twitter.com/ummubaydullah12. @ummubaydullah13Umm UbaydullahSomali, Twitter, accessed July 29, 2015, https://twitter.com/ummubaydullah13. @ummubaydullah14Umm UbaydullahSomali, Twitter, accessed August 17, 2015, https://twitter.com/ummubaydullah14. @Umm ZubayrSomaliyahUmm UbaydullahSomali, Twitter, accessed August 1, 2015, https://twitter.com/ummubaydullah11. 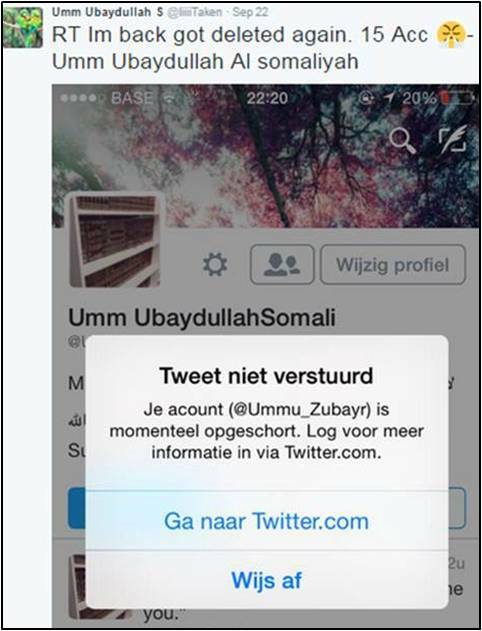 Twitter personality Umm UbaydullahSomali is an alleged Islamic extremist and proponent of violent ideology.Umm UbaydullahSomali, Twitter, accessed July 2, 2015, https://twitter.com/ummubaydullah11. 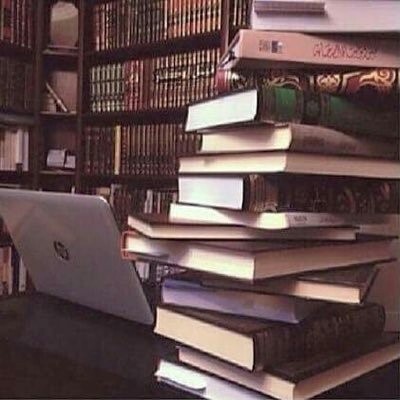 “No mercy to the kufars..”Umm Ubaydullah S, Twitter Post, September 20, 2015, https://twitter.com/IiiiiTaken/status/646345675387576321. “Who would you kill first… Assad or Obama #Bored”Umm Ubaydullah, Twitter Post, October 30, 2015, https://twitter.com/IiiiiTaken. “Brothers and sisters ! Fear the death of your heart, not your body !!! (Tweet)Umm UbaydullahSomali, Twitter Post, June 25, 2015, 10:25 a.m., https://twitter.com/ummubaydullah11/status/614092036824805376. “The purpose of hijab is to divert attention from beauty, not to bring attention to it, so try to avoid excessively decorating it.” (Tweet)Umm UbaydullahSomali, Twitter Post, June 25, 2015, 8:52 a.m., https://twitter.com/ummubaydullah11/status/614068756411777024. “Death is an honour for every Muslim who meets Allaah whilst being upon the Sunnah [way of Muslim life].” –Ibn al-Mubarak رحمه الله [God’s mercy].” (Tweet)Umm UbaydullahSomali, Twitter Post, June 23, 2015, 5:02 a.m., https://twitter.com/ummubaydullah11/status/613285998177464320. “Those who say that stoning is barbaric are worse than animals. (And) they are not Muslims!” Sh. Ibn ‘Uthaymeen in Sharh al- Usool (p. 384).” (Tweet)Umm UbaydullahSomali, Twitter Post, June 23, 2015, 4:52 a.m., https://twitter.com/ummubaydullah11/status/613283587920687104. “Allah’s Messenger, sal allahu alayhi wa salam, said : “You will invade the Arabian Peninsula and Allah will grant it (to you).” [Muslim].” (Tweet)Umm UbaydullahSomali, Twitter Post, June 23, 2015, 4:50 a.m., https://twitter.com/ummubaydullah11/status/613283055323770880.